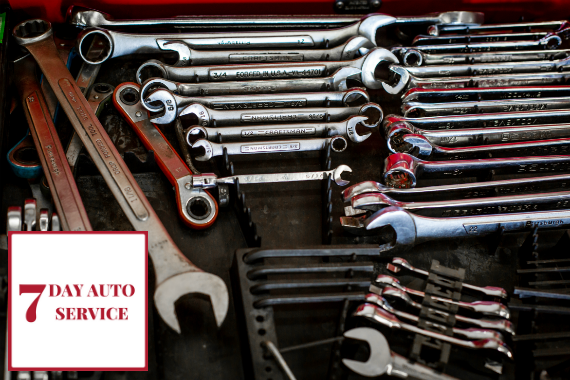 Seven Day Auto Service is proud to be the go-to shop for premier automotive repair and service in Flagstaff, AZ. "Your car should be checked on a regular basis -- how often depends on its state. We can help you make sure your vehicle is up to speed." "We want every repair to leave your car looking as revitalized as this one." "Today is National Get to Know Your Customers Day! We want to know: What aspect of our car repair service do you find to be the most helpful?" "Happiness looks like the perfect car ride." "When your car falls apart, we'll be here to put it back together." Fast friendly and knowledgeable. Hands down the most transparent and honest crew I've ever had work on my car. Yes, I'd like to receive news from Seven Day Auto Service. Sign up for the Seven Day Auto Service Newsletter!